THIS STYLISH PURSE WAS MANUFACTURED BY STONE & CO. 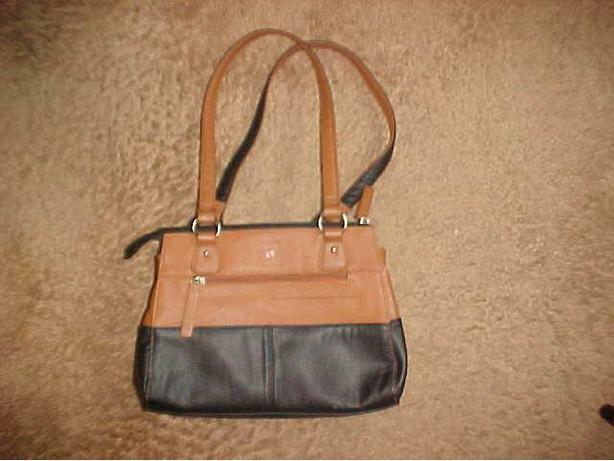 IT IS AN ATTRACTIVE TWO TONE - TAN AND BLACK- COLOR. THE SIZE IS 11 INCHES BY 9 INCHES WITH A BOTTOM DEPTH OF 3 ½ INCHES. IT HAS TWO ZIPPERED OUTSIDE POCKETS AND ONE OPEN ONE. IT HAS A ZIPPERED CLOSING. THE INSIDE HAS ONE ZIPPERED POCKET AND TWO OPEN POCKETS. THE CARRYING STRAPS HAVE A DEPTH OF 10 INCHES. THE PURSE IS IN LIKE NEW CONDITION.